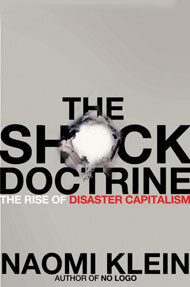 Daily Kos has a review up of Naomi Klein’s new book The Shock Doctrine: The Rise of Disaster Capitalism. Harper’s ran an excerpt from The Shock Doctrine in the October issue which was, as the DKos review says, riveting, and immediately put the book on my must-read list. I’m planning to pick up a copy at Women and Children First Books next time I’m over there. Klein’s 2000 book No Logo forever changed the way I think about branding and advertising â€” some of you might remember that I devoted an early episode of The Partly Dave Show to pieces inspired by No Logo. Naomi Klein is the kind of writer who helps you to connect dots that you knew were there, but didn’t realize were part of a larger pattern. But that’s just the beginning: Klein then goes on to give you a name for that pattern, fleshes out where it came from and how it got to be so powerful, and helps you see how the pattern has been reshaping the world you live in without your knowledge, and how it’s likely to do so even more dramatically in the future. If you can get your hands on the October Harper’s I highly recommend reading the excerpt there. (Subscribers can read it on the Harper’s Web site.) Or, okay, here’s an open link to the same excerpt on a Canadian Web site. Not so long ago, disasters were periods of social leveling, rare moments when atomized communities put divisions aside and pulled together. Today they are moments when we are hurled further apart, when we lurch into a radically segregated future where some of us will fall off the map and others ascend to a parallel privatized state, one equipped with well-paved highways and skyways, safe bridges, boutique charter schools, fast-lane airport terminals, and deluxe subways. In particular, the excerpt lays out how “disaster capitalism” is creating an entire economy, in which enormous private companies like Blackwater take over disaster response and reconstruction, with goods and services concentrated on the wealthy while the poor are left to shift for themselves. The military-industrial complex that Dwight D. Eisenhower warned against in 1961 has expanded and morphed into what is best understood as a disaster-capitalism complex, in which all conflict â€” and disaster-related functions (waging war, securing borders, spying on citizens, rebuilding cities, treating traumatized soldiers) can be performed by corporations at a profit. And this complex is not satisfied merely to feed off the state, the way traditional military contractors do; it aims, ultimately, to replace core functions of government with its own profitable enterprises, as it did in Baghdadâ€™s Green Zone. Blackwater has been called â€œal Qaeda for the good guysâ€ by its right-wing admirers. Itâ€™s a striking analogy. Wherever the disaster-capitalism complex has landed, it has produced a proliferation of armed groups that operate outside the state. That is hardly a surprise: when countries are rebuilt by people who donâ€™t believe in governments, the states they build are invariably weak, creating a market for alternative security forces, whether Hezbollah, Blackwater, the Mahdi Army, or the gang down the street in New Orleans. The reach of the disaster industry extends far beyond policing. When the contractor infrastructure built up during the Bush years is looked at as a whole, what we see is a fully articulated state-within-a-state that is as muscular and capable as the actual state is frail and feeble. This corporate shadow-state has been built almost exclusively with public resources, including the training of its staff: 90 percent of Blackwaterâ€™s revenues come from state contracts, and the majority of its employees are former politicians, soldiers, and civil servants. Yet the vast infrastructure is all privately owned and controlled. The citizens who funded it have absolutely no claim to this parallel economy or its resources. At the 2007 World Economic Forum in Davos, Switzerland, however, political and corporate leaders were scratching their heads over a state of affairs that seemed to flout this conventional wisdom. It was being called the â€œDavos Dilemma,â€ which Financial Times columnist Martin Wolf described as â€œthe contrast between the worldâ€™s favourable economics and troublesome politics.â€ As Wolf put it, the economy had faced â€œa series of shocks: the stock market crash after 2000; the terrorist outrages of September 11, 2001; wars in Afghanistan and Iraq; friction over US policies; a jump in real oil prices to levels not seen since the 1970s; the cessation of negotiations in the Doha round [of WTO talks]; and the confrontation over Iranâ€™s nuclear ambitionsâ€ â€” and yet it found itself in â€œa golden period of broadly shared growth.â€ Put bluntly, the world was going to hell, there was no stability in sight, and the global economy was roaring its approval. This puzzling trend has also been observed through an economic indicator called â€œthe guns-to-caviar index.â€ The index tracks the sales of fighter jets (guns) and executive jets (caviar). For seventeen years, it generally found that when fighter jets were selling briskly, sales of luxury executive jets went down, and vice versa: when executive-jet sales were on the rise, fighter-jet sales dipped. Of course, a handful of war profiteers always managed to get rich from selling guns, but they were economically insignificant. It was a truism of the contemporary market that you couldnâ€™t have booming economic growth in the midst of violence and instability. Except that the truism is no longer true. Since 2003, the year of the Iraq invasion, the index has found that spending has been going up on both fighter jets and executive jets rapidly and simultaneously, which means that the world is becoming less peaceful while accumulating significantly more profit. The galloping economic growth in China and India has played a part in the increased demand for luxury items, but so has the expansion of the narrow military-industrial complex into the sprawling disaster-capitalism complex. Today, global instability does not just benefit a small group of arms dealers; it generates huge profits for the high-tech-homeland-security sector, for heavy construction, for private health-care companies, for the oil and gas sectors-and, of course, for defense contractors. If you want to understand what’s going on in the world as we head into the next decade of disasters, and the opportunism that will follow in their wake, read this book. Here’s the official site for The Shock Doctrine. Lots of great stuff there. The Guardian has a mini-site up with more excerpts from the book, and related videos. Related: an informative DKos post by DHinMI about Blackwater and The Shock Doctrine. While getting Blackwater out would be a good first step, the entire practice of having highly-paid mercenaries operating as a mostly-hidden auxiliary army needs to be laid bare and ended. People should know the real number of fighters the US requires to maintain the status quo (as if the status quo is worth maintaining) in Iraq, and taxpayers should not be paying grossly inflated salaries for mercenaries to remain unaccountable for their unprovoked violence against Iraqis (and, as DHinMI posted on Friday, for their threats against American troops). This stopgap measure is important to take before more Iraqis are massacred by Blackwater, but the system needs to change. Miss Laura is absolutely right…these paid mercenaries need to be exposed and pulled out. Sadly, the mechanism by which the people used to exercise their power and their voices, our system of checks and balances, is now deceased. So what’re we gonna do about it?